In a world of financial institutions, there’s one type that stands out amongst the masses. It’s smaller, which sometimes makes it less visible, so it doesn’t always get all the love it deserves. But this type of financial institution is completely crush-worthy. The type of financial institution I’m loving on? Here’s why you should consider loving them a little harder. In general, credit unions offer higher dividends where you want them: on savings products. That means certificates. That means savings accounts. Surprisingly enough, it also means checking accounts. Let’s do an exercise. Think about your own checking account’s interest rate. If it’s with a bank, it’s probably infinitesimal. Amiright? Now consider a checking account product from a credit union. Let’s specifically look at PenFed’s Access America Checking Account. Currently, as long as you direct deposit $1,000+/month (which is less than most people’s pay from their traditional jobs) you’ll get 0.50% annual percentage yield (APY) paid to you at the end of every statement cycle in dividends if your balance is between $20,000 and $50,000. As with most financial products, of course, rates and terms are variable and subject to change, but when you take into consideration that your lower yielding checking account with a traditional bank likely falls under the same disclaimer, it’s not hard to see why credit unions provide a better option. Those terms are pretty awesome. But for the rest of us who don’t have $20k sitting in checking, you can still get 0.20% APY applied in dividends at the end of every statement cycle with that direct deposit of $1,000+/month. I’m willing to bet that’s at least four times what your traditional bank is paying you right now. At least. In this way, credit unions help you make your money work for you in a very real way. Conversely, credit unions typically offer much lower interest rates for borrowers. That means on loans, you’re likely to end up paying a whole lot less whether you’re borrowing for a car, a house, or a personal loan. Holy moly. That’s over $400 difference in how much you’re paying for your car. Right here we see that credit unions also help you save money in a very real way. Things have only gotten better since a year and a half ago, too. Right now, you can find rates as low as 1.99% APR on 36-month used auto loans at PenFed. P.S. Good luck finding a decent used car for $10k anymore. Just saying. During financial crises, banks tend to cut back their lending, leaving potential borrowers out to dry. In the past ten years, we’ve seen that credit unions operate differently in periods of economic duress. During the height of the Recession in 2008 and 2009, banks’ lending grew by -9.6%. There’s a negative in front of that number, so it didn’t actually grow…it shrank. During the same time period, credit unions expanded their lending by 8%. If we look at a longer time frame, between 2008 and 2014, banks grew their lending by 4.9%, while credit unions grew theirs by 34.1%. The difference is impressive to say the least. Credit unions tend to deal more with people than large corporations, and as a result, they take on less risk and are therefore less affected by dramatic turns in the economic cycle. This allows them to continue lending when other financial institutions all but close up shop. After looking at rate comparisons, getting turned down by a bank may not be such a bad thing, anyways. You’re not only more likely to be accepted by a credit union, but also more likely to pay less on the loan you secure. Credit unions help you make your money work for you. Credit unions help you save money when borrowing. Credit unions are more stable when the economy tanks. With a report card like that, who wouldn’t be crushing? This post is in collaboration with PenFed Credit Union, an organization that is federally is insured by NCUA. Could a Family Mobile Plan Save You Money? This entry was posted in Ways to Make Money, Ways to Save Money on February 12, 2016 by femmefrugality. 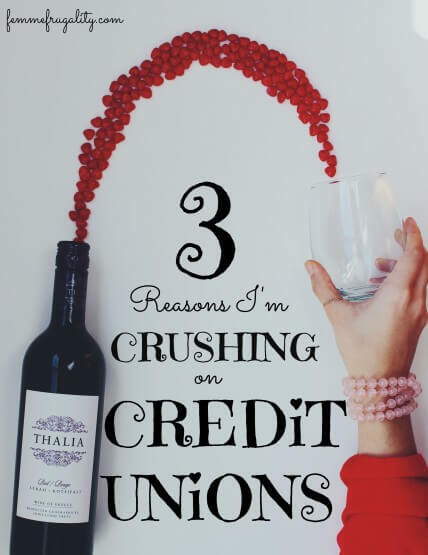 We belong to a credit union, and I wish we could have our business accounts there as well because of the rates, but also because the service is just better. We don’t get nearly as much cross-sale pressure. However, they were super friendly and helpful with our mortgages and when I needed an estate account for my mom’s estate. I’ve noticed our credit union also have additional resources for things like financial literacy and tax prep for members. I don’t know that I’ll ever go back to a regular bank for my regular banking needs. I miss out on sooo many things without direct deposit! I could set it up for myself from my S-corp, but it’s such a hassle and would cost money and… yeah. But I agree that credit unions are better than banks in many ways. I need to look into them at some point. Any day now. We are all in the credit union and have quit banks many years ago. i think the low interest rate on a car got us in the door. Ours doesn’t have the fees i hear about at other places as well. Credit unions are really awesome. I had been meaning to look into one for a long time, but when I opened my Medi-Share account for the medical healthcare ministry, they require you to open an account with a Christian Credit Union they work with – so far, so good and I really like them.